Il nostro cottage privato si trova sulla tranquilla sponda nord del lago Swan, vicino a Swan Lake State Park. Facciamo parte della comunità costiera di Belfast, ma sediamo in pace, a 15 minuti dalla città. Belfast offre ristoranti, negozi e antiquariato. Siamo all'interno di un 1. 25 ore da Acadia e Bar Harbor. Il nostro cottage ha due camere da letto, una con letto matrimoniale e l'altra con una doppia e una serie di letti a castello. Abbiamo una cucina completamente attrezzata, aria condizionata, ventilatore a soffitto e camino a gas per serate accoglienti. Avrai un galleggiante per nuotare, una canoa e un kayak in tandem e grill al propano. C'è una grande TV a schermo piatto con Direct TV e servizio internet, incluso lo streaming. Rilassati sul nostro molo o sul nostro ponte in alto. Puoi aspettarti di vedere aquile e aquiloni calvi, mentre nuotate o pescate sul nostro lago incontaminato. Goditi le stelle! Diamo il benvenuto agli ospiti con i loro proprietari ben educati! We really enjoyed our stay at Mike and Karin's lakeside cottage. They live next door and we enjoyed meeting them. The cottage is well screened for privacy and we had a very relaxing stay. The cottage is comfortable and had plenty of space for two adults to spread out, but the bedrooms were pretty small so it might be a bit cramped for larger groups. We tend to cook a lot at home, and the small kitchen had most of what we needed. The gas grill on the deck was also great to have. The bathroom, although not shown very well in the photos, had a stall shower that was comfortable and clean. The view from the living room was fabulous, and there was a private dock that we enjoyed sitting on. The lake is clean and in late August the water is ideal for swimming. We also enjoyed taking out the canoe on the huge lake. We did have a bit of trouble finding the place initially. The address provided is not specific to the cottage and GPS doesn't know which house is which. Some clearer instructions would have been nice, but we eventually found it. The owners did leave a sheet of other instructions on the kitchen table, which was helpful. While the WiFi signal was good enough for searching the internet, it seemed a bit weak for making calls, and cell reception in that area is not reliable on certain providers. In terms of location, it was a bit of a drive to things, but Belfast was pretty close at 15-20 minutes. Belfast is a great town with much to explore. The Camden Hills are roughly 45 minutes south, and there are some hiking/biking trails in the Belfast area. It's also close enough for day trips to Acadia, Deer Isle, Islesboro, or Vinalhaven. 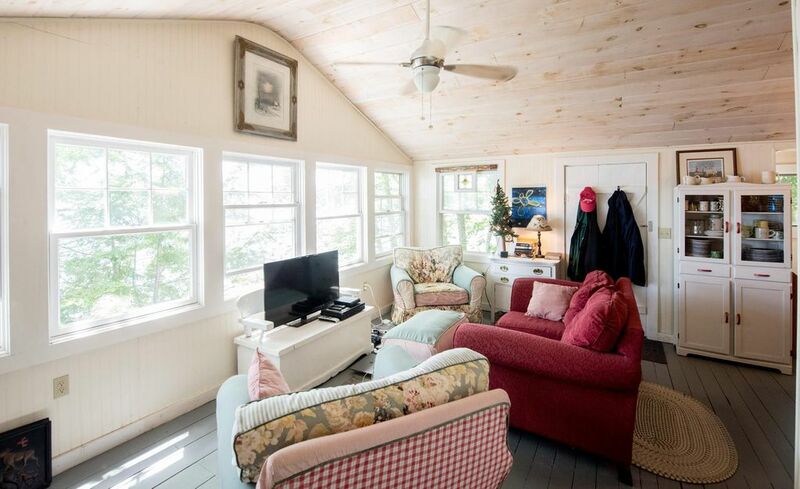 This cottage with waterfront access was just what was needed for a week of relaxation. It had all we needed. Close to Belfast and all the wonderful restaurants!! The owners were attentive and available if needed. We had an awesome time and would recommend this place highly. We enjoyed this charming cottage! We loved the location right on the lake. My husband and I really enjoyed our stay. We took advantage of the location, the lake, the river, and the ocean are all there. The town of Belfast is a friendly easy going place. The path along the river is really nice. The location is in driving distance of Camden with plenty restaurants and shopping. If you go north on route 1 there is several antique shops in Searsport. The cottage was perfect for us. Everything we would need was there. It is charmingly decorated, cute and cozy. We rented this property because it had the canoe and kayak. We only used the canoe for a couple of beautiful days on the lake. Our hosts were friendly and helpful. We are hopeful to return next season! Our guests were a pleasure! Thank you for caring for our cottage! Hope to see you again!